Mrs. Clara Byers, the pregnant mother of four, was widowed in June 1924 when her husband George, A Presbyterian missionary, was murdered, in a botched kidnapping, at Kachek, in the interior of Hainan Island, off the south coast of China. The murder set off an extraterritoriality incident which quickly became a conundrum in which American, British, and Chinese officials; Mrs. Byers, her friends and relatives; and church organizations in China and America all tried to decide how to enforce American treaty rights, protect mission interests, and provide support for the Byers family. 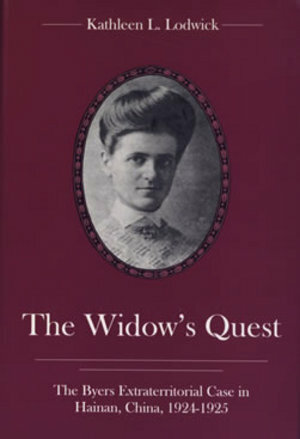 Based on American and British consular archives and those of the Presbyterian Church (USA) and members of the Hainan mission, this is the story of how Mrs. Byers and her ally, Mrs. Mabel Roys, the sole woman on the Presbyterian Board of Foreign Missions (BFM), successfully got the government and their church to take action. The two women would have denied they were feminists, but their persistence saw them prevail against three male-dominated institutions the Presbyterian Church, the U.S. government, and the Chinese government. This is also the story of how they successfully influenced U.S. foreign policy in China with regard to extraterritoriality rights. The women's actions were complicated by the BFM's desire that the case not hinder the work of their missions and the belief of many BFM members that mission funds should not be used to support families at home, even those left destitute by their breadwinner's murder on the mission field. Adopting the "blood of the martyrs" argument, the BFM decided not to seek an indemnity, but allowed the widow to do so as a private citizen. The confused Mrs. Byers countered that her family would not have been in China except by appointment from the BFM, but eventually realized the BFM actually wanted her to accept the indemnity the U.S. government collected, as a matter of policy, because it would reduce the amount the BFM would need to allocate for the support of her family. On the government side, initially a young vice consul visited Hainan, but failed to resolve the case. Then complications ensued, including discussions about treaty revisions, growing Chinese nationalism that was hostile to Westerners, uncertainty over who actually controlled Hainan and even the island's remote location, opposition from liberal mission leaders, and the belief on the part of consular officials that missionary concerns detracted from their work, all of which caused the case to go unattended for many months. Besieged by letters from Mrs. Byers and her friends, Senators and Representatives finally questioned the Department of State, with the result that a second consular official was sent in a gunboat to settle the matter. Faced with the persistence of this vice consul, the warlord in charge of Hainan offered an indemnity that the Americans accepted. Although the culprits were known, they were never arrested and the missionaries returned to their stations in 1925 realizing the settlement of the case was the best they could expect.